I'm happy to hear that the DOB has gone ahead and begun to physically remove illegal signs when OAC's and building owners are non-compliant. I know this has been an uphill battle for the DOB, and this recent action is more akin to the NYSAT project than to normal city operations, which often favor legal proceedings over direct response. This is an indication that New York is finally allowing itself to regulate the public environment, instead of the high powered lawyers and millions of dollars in advertising revenue. Despite this being a somewhat unorthodox and ultimately an authoritative move on New York's part, something we don't necessarily want to condone, it is the only option left. What can they do when this is the way the city and it's residents are treated by outdoor advertising companies? Now the only problem is I'm sure the city paid Service Sign Erectors, the company responsible for the removal of the sign. In fact, chances are this is the same company that puts the illegal advertising signs up in the first place. Photo Carly Sullivan/New York City Department of Buildings. 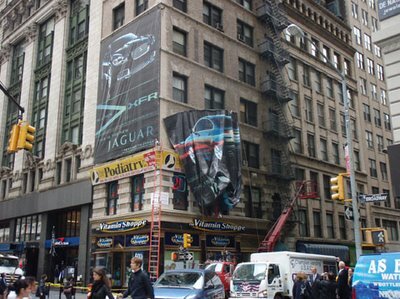 A crew from Service Sign Erectors removed an illegal billboard at Broadway and Maiden Lane under orders from the New York City Department of Buildings. For several years — in spite of 103 violation notices issued against it — a three-story, wrap-around billboard has blanketed the lower floors of the 19th-century Cushman Building, 174 Broadway, at Maiden Lane. On Thursday, clearly feeling that its enforcement efforts had been lost on OTR Media Group, which installed the sign, and 1 Maiden Lane Realty, which owns the building, the Department of Buildings took the sign down itself. “This is the first time the Department of Buildings has physically removed an illegal sign from a building,” the agency’s press secretary, Kate Lindquist, said. A company called Service Sign Erectors performed the work for the city. 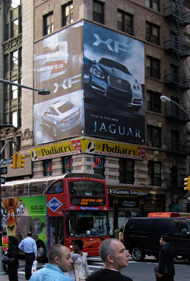 In recent months, the sign had been advertising Jaguar automobiles. By “repeatedly,” the Department of Buildings said it was referring to 103 violation notices issued to OTR and 1 Maiden Lane since July 2007. In January, the agency said, it took the matter to the Office of Administrative Trials and Hearings. The department said that 517 violation notices had been issued to OTR-controlled locations citywide. The company’s phone line is answered by an automatic system. Messages left Thursday at three extensions — the general switchboard, the sales office and the operations office — were not immediately returned. Despite the illegality, buildings are constantly being pressed into service as billboards: the Museum of Arts and Design in April 2006, 475 Fifth Avenue in November 2006, the Chanel building at 15 East 57th Street in October 2008 and the former Brooks Brothers store at Broadway and 22nd Street in March.